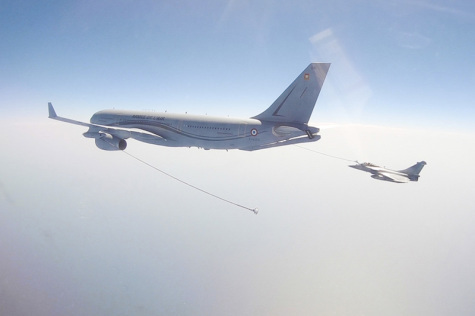 On Friday, March 22, 2019, the A330 Phenix of the 31st Air Refueling and Strategic Transport Wing was deployed to the Levant, as part of the relief of two Rafale combat aircraft. For the first time, the Air Force’s newest strategic aircraft escorted two Rafale from the 30th Wing from Air Base 118 at Mont-de-Marsan, which relieved two Rafale aircraft from the 4th Wing stationed at Air Base 113 at Saint-Dizier. The Phenix took off shortly after 09:00 from the Air Base 125 in Istres, met up with the Rafales on a refueling track off Corsica, and the three aircraft then headed East, skirting the Italian and Greek coasts before separating shortly before reaching Israel. After 4.5 flight hours, the Phenix landed at Amman-Marqa in Jordan; in total, it had delivered just over 12 tonnes of fuel to the two fighters. “This is a small delivery given the capabilities of the Phoenix, and again proves the multi-role capability of this aircraft, including the possibility of mixing missions (transporting freight or passengers during a ferry mission)," explains Major François, the pilot in command. Once arrived at the deployed air base in Jordan, the two single-seater Rafale were put in war configuration. This phase is of paramount operational importance in terms of maintaining QRA capabilities: the planes are always equipped and ready to take off for Operation Chammal. In a few days, after an operational conditioning, they will participate in the fight against the terrorist group Daesh in Iraq. Engaged since November 25, 2018, the four Rafale Bs carried out 300 sorties, totaling nearly 1,500 flight hours, and over 700 in-flight refuelings. As for the two two-seater Rafale Bs, they returned to France a few days later, on March 24, also escorted by the Phenix which refueled them in flight. "The Phenix was designated for this mission a few weeks ago, and it was its first real ferry mission escorting combat aircraft," says Major François. A mission carried out brilliantly that confirms the capabilities of the Phoenix. "In particular, the recently received mission preparation system has been tested and the findings of the report will result in a new GUO (Conveyance Operational Guide), which will include many modifications to the existing one, especially in the phase of planning and preparation of ferry flights." Delivered to the Air Force in September 2018, Phoenix is a multirole aircraft capable of refueling and transport missions, for both freight and passengers. The A330 airliner has been militarized and adapted to the specific needs of the Air Force. Last January, the A330 Phoenix made its first very long-distance mission as part of Exercise Marathon-Monfreid. If deterrence remains the primary mission of the tankers, the Phoenix will also ensure, without any discontinuity and with substantially increased performance, air refueling missions of conventional aircraft and personnel and freight transport, medical evacuation and relaying of communication and intelligence data. Under the 2019-2025 Military Planning Law, the Air Force will be equipped with 15 Phoenix by 2025. Launched on September 19, 2014, Operation Chammal is France’s participation in Operation Inherent Resolve (OIR) and today mobilizes nearly 1,100 soldiers. At the request of the Iraqi government and in coordination with France's allies in the region, Operation Chammal is based on two complementary pillars: a "training" pillar for Iraqi national security units and a "support" pillar to for the action of local forces engaged on the ground against Daesh and to attack its military capabilities. On Monday, March 18, a ceremony on Air Base 107 at Villacoublay marked the award of the military certificate of airworthiness for the A330 Phoenix, five months after the delivery in October of the first strategic multimission aircraft to the Air Force. This event was organized by the Strategic Air Force Command (CFAS), the aircraft operator, and the Aviation Safety Directorate (DSAé), the issuing authority. These approvals, guaranteeing flight safety, are "a significant and visible milestone in the integration of this aircraft into our forces," welcomed General Bruno Maigret, commander of the FAS. Welcoming the work of all stakeholders - including the military air force expertise center (CEAM), the Aeronautical Maintenance Directorate (DMAé) and the Directorate-General of Armaments (DGA), he stressed the significance of the replacement of the C-135s, which "will allow France to continue to ensure its mission of deterrence for decades to come." The Phoenix is a true asset, not only for the Air Force, but for national defense in general: if deterrence remains the primary mission of these tankers, the Phoenix will also ensure, without discontinuity and with substantial performance, increased in-flight refueling capabilities of conventional aircraft, as well as personnel and cargo transport, aeromedical evacuation and communication and intelligence relays. According to the 2019-2025 Military Planning Law, the Air Force will ultimately be equipped with 15 A330 Phoenix aircraft; the Minister of the Armed Forces has accelerated deliveries, so that twelve Phénix will be operational by 2023, two years earlier than previously planned.